April’s beginning, but somehow there’s still that “new year” smell!….so today, I want you to focus! Just take a few minutes to slow down and reflect on your business by answering 10 questions. 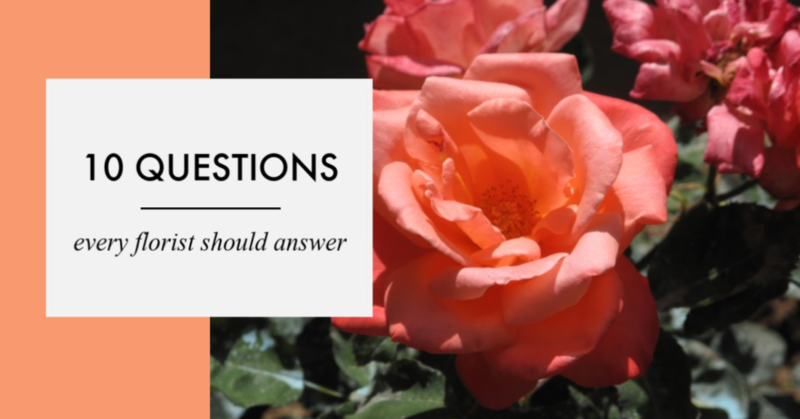 Click HERE to download 10 Questions Every Floralpreneur® Should Answer so you can save these questions to your desktop and revisit them later. 2. What part of running your business are you the best at? 3. What part(s) of running your business do you struggle with most? 4. What’s the #1 thing your customers thank you for? 5. What is your business known for? 6. What do you want your business to be known for? 10. What are your goals for the upcoming year? In order to be in control of your business you must plan for success. Remember, you cannot improve what you do not measure! And if you want more clarity in your business, then get your plan in writing so that you can put those plans into motion! Be brave enough to try something new…and never stop learning! You can download my 8-page Business Planning Basics Guide PLUS watch my 1-hour live chat to help walk you through the work in my “Business Plan Jumpstart”. Ready to level-up? Get a jumpstart by clicking HERE! P.P.S. It’s been an April tradition for me to donate 10% of profits from all course sales to charity and this year I’m picking 3 different causes to donate to! Any course you purchase this April will help support The Vermont Foodbank, Charity Water and The Junior League of Champlain Valley Diaper Bank. Giving back feels good. If you’ve considered buying a course, now’s a great time to do it! Get the courses you want and help support those in need! Win-win.